Running onto a sports field or pitch is no easy task. You’re almost certainly going to get arrested, and there’s people who’s sole job is to stop you, so you have to make sure you have your exit strategy sorted in advance. 19-year-old Justin Buchanan had been planning his little stunt for a while, apparently tweeting about it beforehand (even if his Twitter is private), posting things like ‘Stay tuned’ and ‘Here goes nothing’. 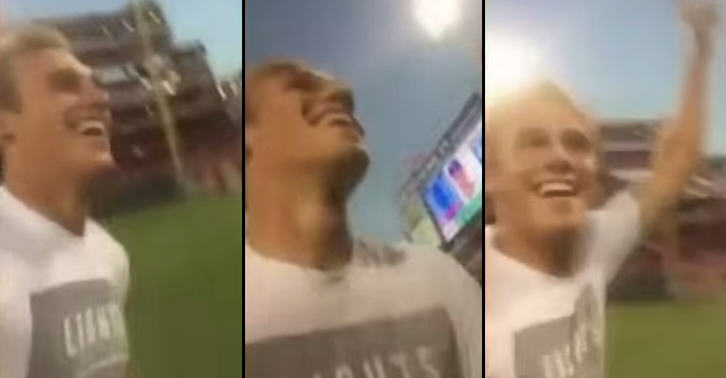 At the Cincinnati Reds vs Chicago Cubs game this week, he managed to get onto the field while filming himself, and run around a bit while the crowd cheered. then the crowd cheered even louder as he managed to escape without being caught, while other people filmed. You know, I don’t think it’d be a big deal. It’s not like I did anything to, you know, I didn’t do anything to Billy Hamilton when I ran past him. I told him ‘What’s up.’ What he said back was not the nicest, but I mean, it’s all just a joke. I don’t think I really interrupted anything. I was just kind of having fun, I guess. I mean, I did it, you’ve got to live with the consequences, but I don’t think I’ll necessarily regret it. I don’t think I’ll be in all that much of trouble, at least I hope not. I think it was just kind of something fun to do. The Cincinnati police don’t quite see it in the same light, though. They have put out a misdemeanor arrest warrant with a trespassing charge.